We’d love your help. 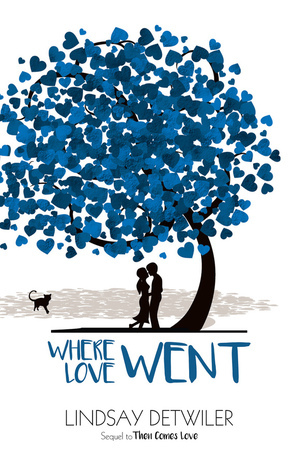 Let us know what’s wrong with this preview of Where Love Went by Lindsay Detwiler. Unexpected news leaves Amelia confused and worried. She loves Owen but is not sure Sometimes unexpected miracles can shift your life off course. To ask other readers questions about Where Love Went, please sign up. Lindsay Detwiler has once again written a fun, sassy, enjoyable, and addictive novel. Last we saw Charlotte, Annie and Amelia life seemed to be going along pretty well for each of them. Until, as usual, life and choices, get in the way. Amelia is suddenly having a life crisis and is afraid Owen will walk away from her. But his sister is wonderful and she and Amelia hit it off immediately. And of course things turn out. It to be as bad as Amelia thinks they will be. Charlotte continues to wage war with Catherine, which doesn't go over well with her husband or the manager of the assisted living facility. Somehow she manages not to be evicted, but she and her archenemy are getting very close. Sooner or later this mixed group all realize they are family in one way or another (Catherine is Joe's mother and Charlotte is Annie's mother and Joe and Annie are married). They are a hodge podge group of people, but they are family for better or worse. Flaws, strengths, and everything in between, each character is wonderful, enjoyable and very relatable. The lessons provided via the story line are truly wonderful and true. Nothing is ever perfect, there will be moments you want to walk away, others you never want to forget but behind it all is love. That is the glue that gets you through the hard times and let's you enjoy the good times. Sometimes it feels like love went away, but in reality, it is still there. It is reaching for it to heal, create better bonds and help work through the difficult times. I HIGHLY RECOMMEND this novel and look forward to the next one in the series (if there is one). I was a little scared to read this after how warm and feely the first book was. I didn't want Charlotte, Annie or Amelia's love story to end. However I was captivated immediately. I found myself laughing at times to wanting to yell at one of them "what are you thinking?" I should have known things would turn out for everyone and I would be all sappy again!! Overall I really enjoyed the book. I was so glad to go back and to catch another glimpse in the fascinating lives of Amelia,Annie,Charlotte and their significant others. This book shows us how life for new lovers is not always all fine and dandy but to make a stronger long-lasting love you have to overcome some difficulties trusting into each other. Lindsay Detwiler has succeeded once again to deliver a very good story with her flawless writing style that makes you laugh and think at every turn of page. This is another winner for Detwiler. A bit sadder than Then Comes Love, it was still a joy to read. It brings out the ups and downs in relationships. I'd recommend this book to anyone who likes a sweet romance. Great story, great characters and great writing. The crazy, fun, and sweet adventures of Annie, Amelia, and Charlotte continue in Where Love Went. Getting to peek into the ladies lives in this continuation kept me turning pages! This is a copy of my Amazon review. Believe it or not, this guy really enjoyed this entry in the :Then Comes Love" story line. The part I love best is the feuding Ladies at the Assisted Living Center: Charlotte and Catherine. Although there may be light at the end for these two, I see more battles. As for Annie and Amelia, you, the reader, are in for a fun ride. I loved the twists, the people from the past poking into their lives again and a lot of mystery. Happily recommend this book, as well as th This is a copy of my Amazon review. Loved this book. Love her style of writing. Please write a sequel to the sequel !